Meet our newest clients, the Feeney family. Parents, Nicole and Dan, have reached out to us here at Beige and Bleu Design Studio to help in the renovation of their home, dealing in particular with universal design. 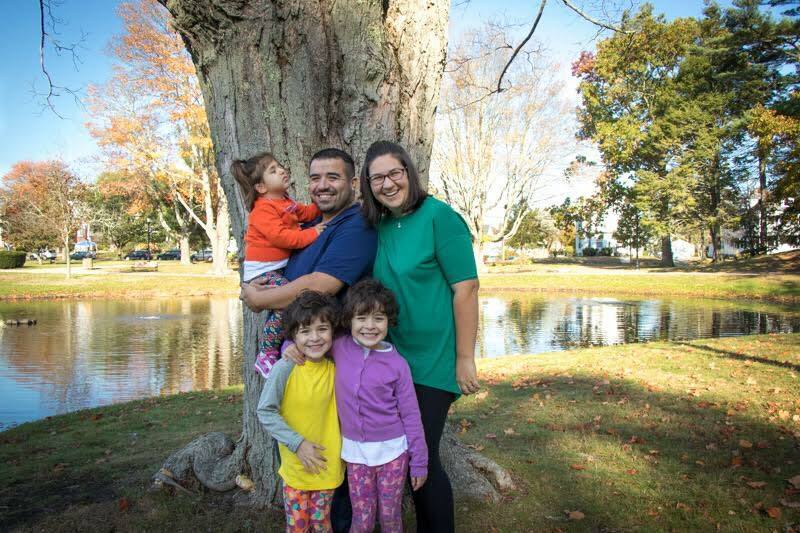 Their 4 year old daughter Shelby, is living with CHARGE Syndrome, a medical condition which comes with many complications including visual impairments, hearing loss, and physical restrictions. At this point, we are unsure how Shelby will progress, but we would like to do our part in making her home a place she can grow to find independence, comfort, and joy, just like we would want for any other 4 year old. In dealing with the design of the Feeney’s space, much of their daily routine can be made that much easier and more engaging with some alterations to the space. This means making a functional space for Shelby, but also a fun and exciting place for her twin sisters, Tamsin and Elyse, and a space where Nicole and Dan can plan to age in place if they so choose. This project is much different than the typical design project, and for us, this is one we have dreamt about since the start. We began our business in hopes of truly making a difference in people’s lives through design, creating a place where functionality meets aesthetics, and there is no better way to do this than through the Feeney’s renovation. Please join us in our efforts to make their dreams a reality. We are seeking assistance, through monetary donations, volunteering of time and services, or even product donations. We want to make this home one that can be used as a model for other families like the Feeneys. It starts with one project, so help us get there! Please reach out to us directly if you would like to be involved. Or, if you are interested in following along with the Feeney’s story, please check out updates here as the project progresses. Help us to make the Feeneys a home that is both functional and beautiful! Moving right along.. and onto the REALLY fun stuff! With our planning phase nearly coming to an end, we're narrowing down on final selections to start our ordering process. We can hardly wait to see the space come together. Our favorite part of every project is when things finally start getting installed, and we see all of the hard work and planning from everyone involved finally start to take shape, as light fixtures turn on, tile gets installed, and paint (bright, bright colors in this case!) start to transform the space. Once the renovation is complete, we will be focusing on soft goods, and making the Feeney's home truly come alive. So, we are beginning to focus our efforts there shortly. We will begin our hunt for unique pieces to fill the space with some well deserved character (another one of our all time favorite parts of the process- we live for the hunt!). We are still actively seeking donations of any kind. I know some have reached out in regards to time donations, it's almost that time! We are sure we will need help on install day, you know, like they do on TV when "the big reveal" happens and when we take a more DIY approach to bringing this space alive. We are so thankful to of had such a great opportunity working with the Feeney's. See below for just another look into Shelby's life and those that surround her! Don't forget to keep checking back for updates, and if you're interested in participating be sure to visit the Go Fund Me page listed at the top of this page. Progress has been made! Ground has been broken, and foundation has been poured. The girls left their mark in the foundation, leaving the family intertwined from the ground up! Here's a few progress shots. The building permit has been obtained, and framing will be starting up soon. On the design side of things, we've begun selecting finishes, and completing the planning for the kitchen and bath layouts. In collaboration with Bellew Tile, we're making some great progress on picking beautiful tile for the new addition. The girls also reminded us not to forget a place for them to play legos! We're getting there! Our client also shared a blog post she wrote, on her experience with the design process, what a great perspective she has! Like every design project, we started by dreaming. And let me tell you, there was no lack of this from the Feeney family. This step needs little to no explanation. The videos below are proof of how excited these girls are about their new renovation! And keep reading to see our concept board, for a glimpse into the feeling of the finished space.